Drilling is at last under way on the frame plates, and we are anticipating their return from the Boro' Foundry within the next few weeks. There will be an update on this information as soon as we have a definite date. We have received quotations from two firms in respect of castings for the horn ties, pony truck centres and buffer beam gussets. Yorkshire foundry Trefoil provided us with the more favourable quote, and the patterns for the above components were delivered by Tony and Chris to the company's Rotherham premises on 8th November. While there, Tony took the opportunity to obtain some information about other companies with expertise in forgings and was given some useful contact addresses. 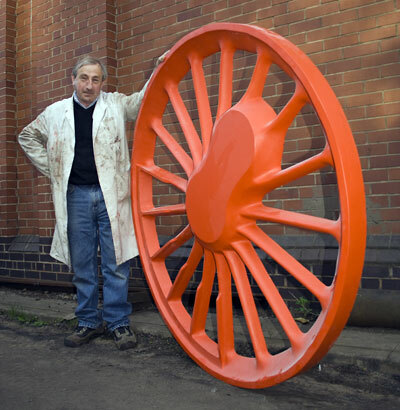 We enquired about the possibility of Trefoil casting the loco's driving wheels and were told that the size was no problem but that the critical factor was weight. We need to ascertain whether the wheels are within the weight limit, though we suspect that they are not. We now look forward to getting on with 82045's frame assembly: funds are in hand to move on with this, and 2009 should show considerable progress on the new loco, all being well! Further details of these, along with other recent news about the Fund, can be found in the Autumn Newsletter which will be out shortly.